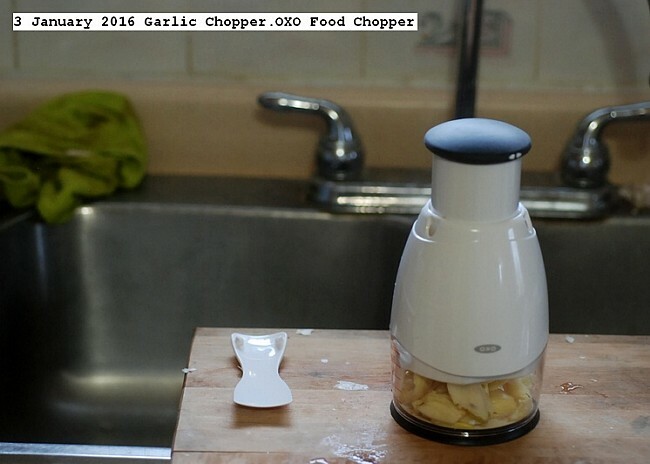 Garlic Chopper: To maximize health benefits, crush the garlic at room temperature and allow it to sit for at least 15 minutes or longer. The process triggers an enzyme reaction that boosts the healthy compounds in garlic.To make smaller pieces I was using a mortar and pestle, but found it too tedious and not an adequate result,so purchased an OXO Food Chopper. This is achieves the desired result with minimum effort. My method is to separate the cloves from the bulb, cut the hard piece off the end of the clove if desired. Crush the clove with skin by pressing down on the tortilla press without using the handle. Remove the skin easily. Scrap into the container for the OXO Food Chopper. Complete for all cloves.Push the handle of the chopper a number of times to get the desired texture. Let stand for at least 15 minutes or longer before using. If cooking use low heat and fry for a few minutes to eliminate the hot stinging taste effect. It may be used raw in salads or other dishes. There are hand garlic presses similar to pliers, that do not function well and are awkward to clean.Take the OXO Food Chopper apart and clean under running water immediately after use.It may also be placed in a dishwasher if desired, but running water cleaning and air drying is adequate.